The GearWrench 1 13/16 (29mm) 1/2'' Drive Oil Sender Socket fits 1 3/16'' oil pressure sending units found on Late-80's and Mid-90's GM Vehicles, and is 90mm long. The 3919D GearWrench 1 13/16 (29mm) 1/2'' Drive Oil Sender Socket is one of thousands of quality tooling products available from MRO Tools. Please browse GearWrench Fuel Tools for tools similar to the 3919D GearWrench 1 13/16 (29mm) 1/2'' Drive Oil Sender Socket. 3919D GearWrench 1 13/16 (29mm) 1/2'' Drive Oil Sender Socket description summary: GearWrench 1 13/16 (29mm) 1/2'' drive oil sender socket. 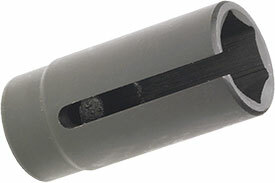 Quantity discounts may be available for the 3919D GearWrench 1 13/16 (29mm) 1/2'' Drive Oil Sender Socket. Please contact MRO Tools for details.